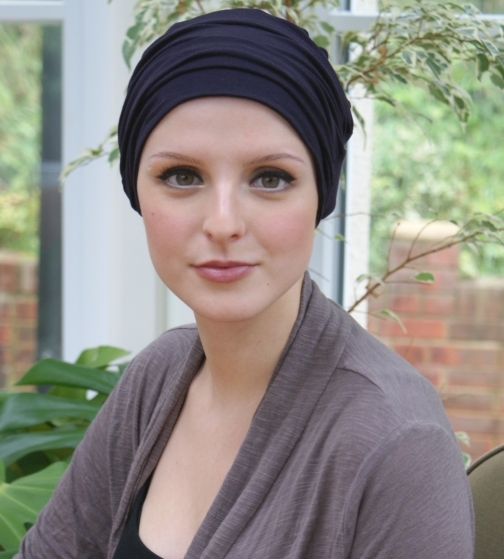 Super soft jersey turban for hair loss, beautifully simple and unfussy. There is a gathered fabric section at the front; you can position the folds of fabric once on. 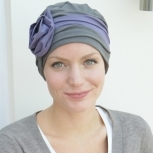 This adds soft volume and height to the face profile and makes it a chic stylish turban to wear. Kimmy is new for Autumn/Winter and is released in lots of colours to match the season. 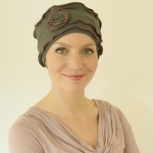 This is the ultimate in 'pull on and go' hair loss headwear, because with minimal effort it looks elegant during the day, or you can make it super dressy for the evening and accessorise with a silk scarf. (Scarf shown is not included with the hat.) This style is also good for 'layering'. When the temperature drops you need a warm outdoor hat to keep you head warm, which you can pull on over this. 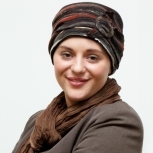 When you arrive back indoors you can take off the outer hat and your head will remain covered by this soft jersey (liner) turban. We're confident once you've tried this style and found how versatile and comfortable it is to wear, you'll want one in every colour! This hat has been featured on the very marvellous eyelineher.blogspot.co.uk. Colours now available in this style - Teal green (a lovely shade of sea green), Black (shown), Cream, Sky Blue (shown), Grape (Eggplant), Beige (light brown), Blackberry mauve, Cobalt Blue / Grey ( a dark navy grey), Burgundy red (a deep red shown) and Chocolate brown.